Where to Start? The basics. The Ku Klux Klan has approximately 150 active cells, operating in 41 states, with membership concentrated in both the South and the Midwest. The KKK is not what it once was but it does continue to survive in various locations throughout the United States. At its peak, membership was in the millions. Now, membership is likely less than 5,000. It is very important to understand - the KKK does not have a central unified leadership. Instead, they are split off into local cells or groups. These groups generally oppose interracial relationships, homosexuality and illegal immigration and historically express this ideology through acts of terror. We want to remind you: This operation is not about the ideas of members of the Ku Klux Klan. This is about the behaviors of members of KKK splinter cells that bear the hallmarks of terrorism. When members of the KKK like Frazier Glenn Miller, (founder of the Carolina Knights of the Ku Klux Klan and the White Patriot Party) murdered three innocent individuals at a Jewish retirement home during Passover - the word "terrorism" was seldom found in mainstream media's coverage of the attack. Why? What sort of violence does it take to call *some* factions of Ku Klux Klan what *some* of these cells really are? We defend free thought and free speech. The anons responsible for this operation will not support *acts* of terrorism and *acts* of hate inflicted upon the public. The KKK is part of an important cultural landscape and history in the United States. We need to make room for important, blunt, honest, public, productive conversation. Violent bigotry IS a problem in the United States. This is not a colorblind society. It deeply divided on racial lines. We hope Operation KKK will, in part, spark a bit of constructive dialogue about race, racism, racial terror and freedom of expression, across group lines. Public discourse about these topics can be honest, messy, snarky, offensive, humbling, infuriating, productive, and serious all at once. The reality is that racism usually does NOT wear a hood but it does permeate our culture on every level. Part of the reason we have taken the hoods off of these individuals is not because of their identities, but because of what their hoods symbolize to us in our broader society. In media, the Ku Klux Klan is an easy target to pick on. In terms of the KKK, journalists usually print what they want with very little consequence because sensational stories like this generate impressive ad revenue (just like with the bogus OpKKK leak). We feel it is important to provide accurate information about our observations during this operation. We learned, that aside from our striking differences in overall ideology and behavior, we have found that many members of Ku Klux Klan groups actually have a few important similarities to us. For example, they are mostly poor and pissed off at the the Man. They oppose government surveillance and they generally feel persecuted for free thought. Day to day, some klan members work very hard for very little. This is a common ground we understand all to well. We feel that the ability to find common struggles with those that are very different than ourselves is important. Even if they are filled with hatred. We will never sympathize with the KKK but we do desire to understand them and learn about how they see their world. We do see their humanity, we respect their right to free thought and we know their fear of others is wrong. We also know their behaviors strike fear, anxiety and terror into others. This will no longer be socially tolerated. In this dox list, you will find official members of various KKK groups throughout the United States as well as their closest associates (most are also in other extremist hate groups). You will see many names with ALIAS beside it. If indicated, these are CONFIRMED aliases. Other names on this list may be aliases, as well. Some aliases we were unable to crack. The klan sometimes hides behind several online identities. Given name or alias, these are the real people underneath the hoods. It is important to note that many klan members change klan affiliations as well as go back and forth between being klan members and neo nazis etc (sometimes both, if permitted). There is quite a bit of movement between these types of groups (usually due to infighting). For this reason, you will see some names of individuals that are listed as neo nazis and so on. Some members of this list are quite dangerous, sociopathic individuals. Others are not. Data collected for Operation KKK was gathered over approximately 11 months and those included on this list were identified primarily through HUMINT (human intelligence) data collection strategies. This means that individuals on this list were often identified by human sources of information through both overt (interviewing expert sources) and covert (digital espionage / social engineering) methods. Individuals on our list were also identified through open source intelligence strategies (OSINT). This is a broad array of information and sources that are generally available to the public. This includes: multimedia, academic records and public data. Members often told on themselves to us about their connections with the KKK during various chat conversations we had with klan members and affiliates throughout the course of our operation. You never know who you are talking to on the internet. We understand this initiative is extremely controversial and we know we will face much criticism for this operation and our work will be heavily scrutinized. We hope this body of work speaks for itself. This is the OFFICIAL Operation KKK 2015 intel report associated with the @Operation_KKK Twitter account. The anons at @Operation_KKK are responsible for this specific liberation of information and we have done our best to ensure accuracy and avoid collateral damage to innocent parties. Erring on the side of caution, we removed several names from this list for further evaluation. We consider this data dump as a form of resistance against the violence and intimidation tactics leveraged against the public by various members of Ku Klux Klan groups throughout history. The language of the KKK has evolved over 160 years. This portion of this article related to vocabulary may help you understand what you are looking at while you review the links contained in this report. TRIGGER WARNING: This report contains some links to media content (such as images, video, audio) as well as links to profiles that contain graphic language and hate vitriol. These links may be upsetting, disturbing and/or uncomfortable. 2these are the officials that have political power in the usa that are associated with either kkk or racist related. addresses will not be released so nobody gets it in their mind to take out their own justice against them. 1.United States Senator From North Carolina: Thomas Tillis aka Thom Tillis: Age 55: Wife Susan Tillis, Both living in: Cornelius, North Carolina.Known KKK Affiliated group:United Northern and Southern Knights of the Ku Klux Klan. Thornton. 2.United States Senator From Texas: John Cornyn: Age 63: Wife Sandy Cornyn, Both living in: Austin,Texas: Known KKK Affiliated Group: United White Knights Of The Ku Klux Klan. 3.United States Senator From Georgia: John Hardy Isakson: Age 70: Wife Dianne Davison: Both Living in: Marietta, Georgia. Known KKK Affiliated Group: Original Knight Riders Of the KKK. 1. Knoxville,Tn Mayor: Madeline Anne Rogero: age 63: last known spouse Gene Monaco: Living in Knoxville,Tn: Known KKK Affiliated Group: KU KLOS KNIGHTS of the Ku Klux Klan. In the age of rapid consumerism, repetition, and government warmongering there are always those caught in the crossfire. At some point you could very well wind up in that crossfire or in simpler terms: homeless. Certain religious organizations believe that faith and hope protect the people of this world, but at the end of the day it is a person that hands a starving child a bowl of rice, the cold a coat, blanket and a hot meal. Everyone's story is different as to how they got where they are. Even though attention should be given to hear their story, it is not where you've been that is relevant, it is where you are going. You don't walk backwards through life, you walk forward. There is some, but little need to look behind you as you move forward from life's struggles. If you kept your eyes open, then you would have known very well, what was there and where you were going. 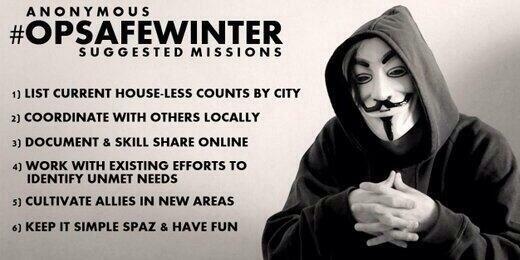 In the interest of moving forward, we bring to you #OpSafeWinter. Certain governments frown upon helping their discarded and unwanted, we do not. We believe that human life matters. Empathy matters. Standing in unison matters. The cold, starving and homeless matter. Together we can accomplish a lot, however, this op (operation) is most likely going to be one you can organize and exhibit in your area. This is a hands on op and you will need to be physically involved in your area for this to be effective. Using your social media networks and other mediums, you can reach out to friends and family telling them that you're looking for resources. We advise you to come up with a personalized mission statement rather than to admit your ties to Anonymous, due to the logging that is done within said social media environments and other administrative forces. If you know a place where you can set up a drop box/bin (or use a small building that people can bring things into, in a public area, with permission i.e a shed) this would be a great environment to rapidly gather resources in a timely manner. We wish to see things done of "your" effort. Resist in using materials from other donation based systems that are already in place (i.e churches or other homeless systems/shelters currently active) but you CAN use them for collecting information. Those organizations have already donated as much as they can. This is an Anonymous effort, we use our OWN resources. With that being said, giving your resources to these organizations so they can distribute them to where they need to go is an alternative "IF" you can verify the organizations are legitimate and actually helping who they say they help. Otherwise, you can opt to distribute items yourself through one-on-one encounters, but be very cautious in doing so. Not all homeless are friendly and not all homeless are trusting. Protect yourself. Some areas have illegalized the act to help the homeless. As such, please contact the appropriate governing bodies within your area to answer that information. We can collect and provide some information through this operation, but you are responsible for your actions. Most of this stuff is small and can be put into a normal carry bag or backpack and can be given to a homeless person once you run into them. We would, at this time, prefer to stay away from risk items. - Knives/utility knives: You do not know if it would be used for defence or offence. It would cause more issues than it would solve. - Medications (Both prescribed and non-prescription): Even though the homeless get sick, we can easily see this getting abused. - And any other item that can or may cause harm internally or externally. Zoning: Your area(s) of attack. Pick an area you have physical access to and research it. Contact that area's appropriate governing body and ask about the laws for helping the homeless. Pick heavily populated areas, where homeless people usually are. If you know of a homeless person that is not in a populated area, you can choose to assist them instead/as well. You can at this time opt to investigate what the area(s) already offer to the homeless and put together an information packet for homeless people to read. - Are there free bathing areas? Hot meals? Shelter? Pro-bona doctors? Pro-bona dentists? Pro-bona optical care? - Are there places to go for more resources like free clothing? Free food? - Are there places that assist the homeless to get out of their rut and assist with job seeking? Include anything you can put together in a packet of information that would give them hope for a better future. In large areas you can use gas stations, supermarkets, fast food restaurants, etc as markers to help a person find the location of a service. Most of the materials can easily fit inside a backpack or bags. Make many 'care' packages and don't forget the information packet. Bring protection with you, either friends willing to help or if you're going alone bring something for protection within the confines of the law in your area. Not all homeless are nice, not all homeless are trusting. Respect the situation they are in and always be aware of your surroundings. This research will differ in a zone to zone basis. ALWAYS make sure the organization(s) do the things they claim to do. In the USA there are websites such as www.bbb.org that keep business' in check. BBB is a place people can go to rate and find ratings on these organizations. Look up any website like BBB that exists in your area. Once you have verified with them, call them and tell them you have care packages you wish to drop off for them to distribute to the homeless. We only ask one thing from you if you decide to go this route. Do at least ONE personal one-to-one distribution to a homeless person. Anonymous isn't a dinky group any more. If we can get people we know to do ONE one-to-one distribution with a homeless person, we will help a lot of people. If you opt to take and publish pictures/videos in full Anonware to show your support of the operation, that is your choice. Before uploading, strip your EXIF data from the pictures (searchable) and use the hashtag #OpSafeWinter on places such as Twitter. Nothing wrong with getting the word out, but retain focus. This is about helping the homeless not your own personal glory. Don't bite off more than you can chew. Remember quality over quantity. This is a general guideline to get you thinking about ideas for your area. If you personally only help out one homeless person, that's wonderful. /tips hat and gives a most courteous bow. This is only to give you ideas on how to help vs your choice of personal level of involvement. Help one, help many, the choice is yours, do what you can. Action will change the course of this planet.